Anthracite Grey is a popular colour, we have 9mm and 16mm boards, vented, soffit or reveal liner. We also have shiplap in anthracite grey. 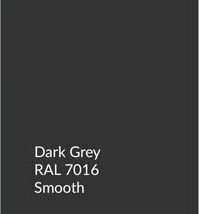 Anthracite Grey and Dark Grey are both the same colour (RAL 7016). The differences between both are the texture of the board. 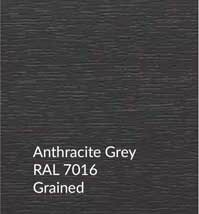 Anthracite Grey has a wood grain effect while Dark Grey has a plain smooth finish. 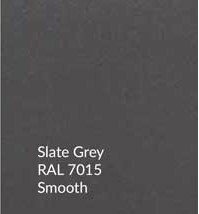 Slate Grey is a lighter colour than Anthracite Grey and Dark Grey. The finish is also plain smooth just like Dark Grey. RAL Colour: 7016 Product Length: 2.495m Product Width: 150mm, 175mm, 200mm, 225mm, 250mm, 300mm or 405mm Product Thickness: 9mm Return Leg: 38mm Accreditations: BBA & BSI Approved Guarantees:10 years Product Type: uPVC Woodgrain Anthracite 9mm Reveal Liner Other..
RAL Colour: 7016 Product Length: 5m Product Width: 150mm, 175mm, 200mm, 225mm, 250mm, 300mm or 405mm Product Thickness: 9mm Return Leg: 38mm Accreditations: BBA & BSI Approved Guarantees:10 years Product Type: uPVC Woodgrain Anthracite 9mm Reveal Liner Other: Availab.. Description: 175mm Dark Grey 16mm Full replacement 5m fascia boards. No backing timbers required. (External size) Colour: Dark Grey Dimensions: 16mm x 175mm x 2.5m Features: Reflects 80% of the suns harmful rays 12 times thicker than traditional foils Superior embossed effect over t.. Description: 175mm Dark Grey 16mm Full replacement 5m fascia boards. No backing timbers required. (External size) Colour: Dark Grey Dimensions: 16mm x 175mm x 5m Features: Reflects 80% of the suns harmful rays 12 times thicker than traditional foils Superior embossed effect over tra.. Description: 225mm Dark Grey 16mm Full replacement 5m fascia boards. No backing timbers required. (External size) Colour: Dark Grey Dimensions: 16mm x 225mm x 2.495m Features: Reflects 80% of the suns harmful rays 12 times thicker than traditional foils Superior embossed effect.. Description: 225mm Dark Grey 16mm Full replacement 5m fascia boards. No backing timbers required. (External size) Colour: Dark Grey Dimensions: 16mm x 225mm x 5m Features: Reflects 80% of the suns harmful rays 12 times thicker than traditional foils Superior embossed effect ove.. Description: 400mm Dark Grey 16mm Full replacement 5m fascia boards. No backing timbers required. (External size) Colour: Dark Grey Dimensions: 16mm x 400mm x 2.495m Features: Reflects 80% of the suns harmful rays 12 times thicker than traditional foils Superior embossed effect over.. Description: 400mm Dark Grey 16mm Full replacement 5m fascia boards. No backing timbers required. (External size) Colour: Dark Grey Dimensions: 16mm x 400mm x 5m Features: Reflects 80% of the suns harmful rays 12 times thicker than traditional foils Superior embossed effect over tra.. Description: 400mm Dark Grey 16mm Full replacement 5m fascia boards. No backing timbers required. (External size) Colour: Dark Grey Dimensions: 16mm x 400mm x 1.2m Features: Reflects 80% of the suns harmful rays 12 times thicker than traditional foils Superior embossed effect over t..
RAL Colour: 7016 Product Length: 2.495m Product Width: 200mm Product Thickness: 9mm Return Leg: 38mm Accreditations: BBA & BSI Approved Guarantees:10 years Product Type: uPVC Woodgrain Anthracite 9mm Reveal Liner Other: Available in a range of colours including, Light Oak..
RAL Colour: 7016 Product Length: 5m Product Width: 200mm Product Thickness: 9mm Return Leg: 38mm Accreditations: BBA & BSI Approved Guarantees:10 years Product Type: uPVC Woodgrain Anthracite 9mm Reveal Liner Other: Available in a range of colours including, Light Oak, Wh.. Description: 150mm Dark Grey Ral Colour 7016 - Foiled 16mm uPVC 5m Shiplap Cladding Dimensions: 150mm x 5m Anthracite Grey .. Manufacturer: Homeline Product Length: 5m Product Dimension: 25mm Accreditations: BSI Approved Guarantees: 10 years Product Type: uPVC Anthracite Grey D-Section .. Manufacturer: Homeline Product Length: 5m Product Width: 40mm Product Thickness: 6mm Accreditations: BSI Approved Guarantees: 10 years Product Type: uPVC 6mm Anthracite Grey Architrave ..
RAL Colour: 7016 Product Length: 2.495m Product Width: 225mm Product Thickness: 9mm Return Leg: 38mm Accreditations: BBA & BSI Approved Guarantees:10 years Product Type: uPVC Woodgrain Anthracite 9mm Reveal Liner Other: Available in a range of colours including, Ligh.. Manufacturer: Homeline Product Length: 5m Product Width: 60mm Product Thickness: 6mm Accreditations: BSI Approved Guarantees: 10 years Product Type: uPVC 6mm Anthracite Grey Architrave ..
RAL Colour: 7016 Product Length: 5m Product Width: 225mm Product Thickness: 9mm Return Leg: 38mm Accreditations: BBA & BSI Approved Guarantees:10 years Product Type: uPVC Woodgrain Anthracite 9mm Reveal Liner Other: Available in a range of colours including, Light Oak, Wh.. Manufacturer: Homeline Product Length: 5m Product Width: 90mm Product Thickness: 6mm Accreditations: BSI Approved Guarantees: 10 years Product Type: uPVC 6mm Anthracite Grey Architrave ..
RAL Colour: 7016 Product Length: 2.495m Product Width: 250mm Product Thickness: 9mm Return Leg: 38mm Accreditations: BBA & BSI Approved Guarantees:10 years Product Type: uPVC Woodgrain Anthracite 9mm Reveal Liner Other: Available in a range of colours including, Ligh..
RAL Colour: 7016 Product Length: 5m Product Width: 250mm Product Thickness: 9mm Return Leg: 38mm Accreditations: BBA & BSI Approved Guarantees:10 years Product Type: uPVC Woodgrain Anthracite 9mm Reveal Liner Other: Available in a range of colours including, Light Oak, Wh.. Manufacturer: Homeline Product Length: 5m Product Width: 20mm Product Thickness: 6mm Accreditations: BSI Approved Guarantees: 10 years Product Type: uPVC 20mm Anthracite Grey RAL 7016 Edge Fillet Trim ..
RAL Colour: 7016 Product Length: 5m Product Width: 300mm Product Thickness: 9mm Return Leg: 38mm Accreditations: BBA & BSI Approved Guarantees:10 years Product Type: uPVC Woodgrain Anthracite 9mm Reveal Liner Other: Available in a range of colours including, Light Oak, Wh.. Product Length: 5m Product Width: 12mm Accreditations: BSI Approved Guarantees: 10 Years Product Type: uPVC Anthracite Grey Quadrant Trim .. Product Length: 5m Product Width: 19mm Accreditations: BSI Approved Guarantees: 10 Years Product Type: uPVC Anthracite Grey Quadrant Trim ..
RAL Colour: 7016 Product Length: 2.495m Product Width: 300mm Product Thickness: 9mm Return Leg: 38mm Accreditations: BBA & BSI Approved Guarantees:10 years Product Type: uPVC Woodgrain Anthracite 9mm Reveal Liner Other: Available in a range of colours including, Ligh..
RAL Colour: 7016 Product Length: 1.2m Product Width: 400mm Product Thickness: 9mm Return Leg: 38mm Accreditations: BBA & BSI Approved Guarantees:10 years Product Type: uPVC Woodgrain Anthracite 9mm Reveal Liner Other: Available in a range of colours including, Light ..
RAL Colour: 7016 Product Length: 2.495m Product Width: 400mm Product Thickness: 9mm Return Leg: 38mm Accreditations: BBA & BSI Approved Guarantees:10 years Product Type: uPVC Woodgrain Anthracite 9mm Reveal Liner Other: Available in a range of colours including, Ligh..
RAL Colour: 7016 Product Length: 5m Product Width: 400mm Product Thickness: 9mm Return Leg: 38mm Accreditations: BBA & BSI Approved Guarantees:10 years Product Type: uPVC Woodgrain Anthracite 9mm Reveal Liner Other: Available in a range of colours including, Light Oak, Wh.. The Anthracite Grey Cladding Edge Trim can be used to neaten cladding around windows or to start the first length of the cladding. .. The Anthracite Grey Cladding U-Trim can be used to neaten cladding around windows or to start the first length of the cladding. .. The Anthracite Grey uPVC Cladding 2-Part Corner Trim extension is used to return lengths of dark grey cladding around a 90-degree corner. This 2 part trim is easy to install by fixing the internal piece under the grey cladding, and the external part over the cladding. Provided as a 5m length. ..
Anthracite woodgrain grey H-Section for use with hollow soffit, flat boards and vented flat boards RAL Colour: 7016 Product Length: 5m Accreditations: BBA & BSI Approved Guarantees: 10 Years Product Type: uPVC Woodgrain Anthracite Grey Cladding Centre Joint, H-Section, H-Trim, Con.. Description: Anthracite Grey 135 Degree Angle Colour: Matching Anthracite Grey Dimensions: 500mm Long Click Here To See All 9mm Upvc Anthracite Fascia Cover Board and Soffits Sizes Options & Prices. Or Follow The Links Below For Related Products - Anthrac.. Product Length: 500mm Product Width: 50mm x 50mm Accreditations: BSI Approved Guarantees: 10 years Product Type: uPVC 500mm Anthracite Grey Square Internal Double Ended Fascia Joint Click Here To See All 9mm Upvc Anthracite Fascia Cover Board and Soffits Sizes Options &.. 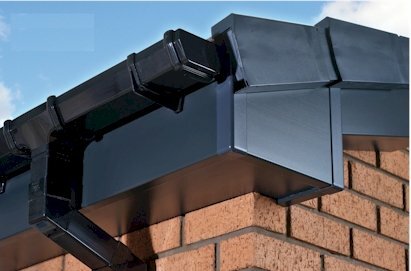 Description: Anthracite Grey Fascias Joint for use with 17mm Dark Grey Fascias Colour: Matching Anthracite Grey Dimensions: 500mm Long Click Here To See All 9mm Upvc Anthracite Fascia Cover Board and Soffits Sizes Options & Prices. Or Follow The Links Bel.. Description: Anthracite Grey Fascias Corner Joint Colour: Matching Anthracite Grey Dimensions: 500mm Long Click Here To See All 9mm Upvc Anthracite Fascia Cover Board and Soffits Sizes Options & Prices. Or Follow The Links Below For Related Products - Ant..